But this article is not about Roger. It’s about tennis rackets. I have a keen interest in sporting equipment and how it can help or hinder performance. So in this article, I am going to give some helpful advice about buying a tennis racket for beginner adult players. The article is based upon my own experiences of playing tennis and advice from tennis coaches. I also give a few recommendations of some really good beginner tennis rackets you can buy. It’s important to play with an appropriate tennis racket when learning the game. If you use a racket designed for beginners, you should experience far more success than a racket designed for an advanced player. With the right racket, you’ll be able to get more balls over the net and into the court. You will enjoy playing tennis more. If you enjoy playing, you’ll want to play more. If you play more, you’ll improve quicker. Your tennis racket matters. It’s worth spending a bit of time researching your options. Ideally, you should choose a racket with a larger head size. 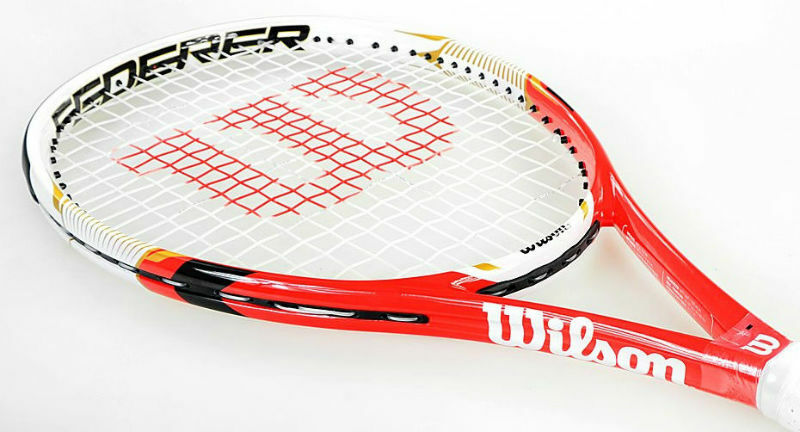 A racket with a larger head size will have a larger sweet spot. This is the area in the middle of the racket where you want to hit your shots. Having a larger sweet spot is useful for beginners, because your technique is still developing. You won’t be hitting the ball perfectly every time to begin with. But with a larger racket head and sweet spot, you’ll find it easier to get the ball in, even if your timing and stroke isn’t quite right. A good racket for beginners should be lighter in weight. You will find it easier to swing the racket and will be able to play for longer before tiring. Heavier rackets can be a little harder to move about to begin with, as the muscles you use for tennis are still developing. A light-weight racket should feel fairly effortless to pick up and swing. You probably should be cautious of getting a racket which is too light, as you may develop poor technique, like flicking your wrist. The rackets I recommend below are a good compromise. Not too heavy. Not too light. How much does a beginner tennis racket cost? The good news is that you don’t need to spend ridiculous money on a decent beginner tennis racket. Most beginner rackets will be made from aluminium, which is cheaper than the graphite material used in more expensive rackets. A decent beginner racket will cost between £20-£50 / $30-$70. A beginner tennis racket won’t be a racket for life. When you improve to an intermediate standard you will need to upgrade your racket. But any of the rackets above will be good to begin with. If you play tennis for a little while, but stop to pursue other interests, you haven’t wasted much money. But hopefully you will play, fall in love with the sport and keep on improving and improving. And if this happens to you, then this small cost to buy a beginner racket, will be a fantastic investment.